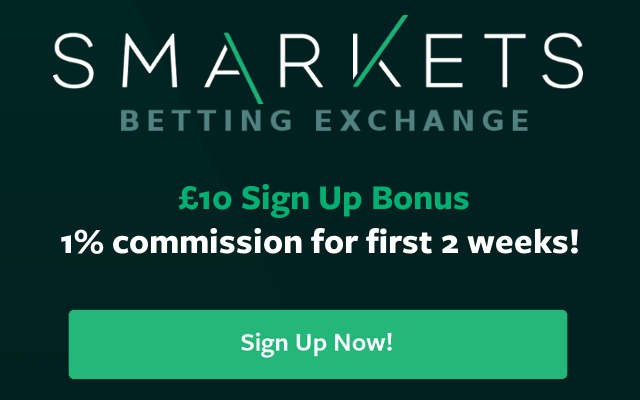 I am always on the look-out for anything that can help punters increase their betting profits, so today I am delighted to reveal details on a unique low commission deal now available with the betting exchange – Smarkets – exclusively available to SBC readers & members. Instead of their usual 2% rate, anyone opening a new account with Smarkets via our exclusive SBC link can now enjoy a special low 1% commission rate on bets placed during your first 2 weeks. This is in addition to the £10 welcome bonus available once you deposit and bet £20. The standard commission for Smarkets stands at an already low 2% on all winnings, yet I asked them to do something special for Smart Betting Club readers & members keen to try them out. The result – this 2 week exclusive 1% commission deal, which is only available with us. To take advantage – simply click this special SBC link and open an account with Smarkets. The lower 1% commission rate will automatically be applied for the first 14 days after opening an account. I get approached by a lot of bookies asking me to promote their services and the vast majority of them are either after losing gamblers and are simply wasting my time. When they find out that the majority of SBC members are winners, they quickly run a mile. Smarkets are different as not only do they offer great value odds in a range of betting markets, but as an exchange, they actively welcome winners and offer a real alternative to those of you looking for a replacement for the likes of Pinnacle Sports. I have used Smarkets for my own betting for several months and have been impressed by the value odds I have been able to achieve plus the service on offer. Bets have been settled quickly and any deposits/withdrawals made with no fuss. The fact they are willing to offer this special low commission deal also sets them aside from all the usual tired bookmaker suspects. Smarkets cover a whole range of markets including Horse Racing, Football (lower league and European) plus other sports such as Tennis, Rugby & Golf. Back in October I also conducted an in-depth interview with them to find out more on exactly what it is they offer. Read this here. 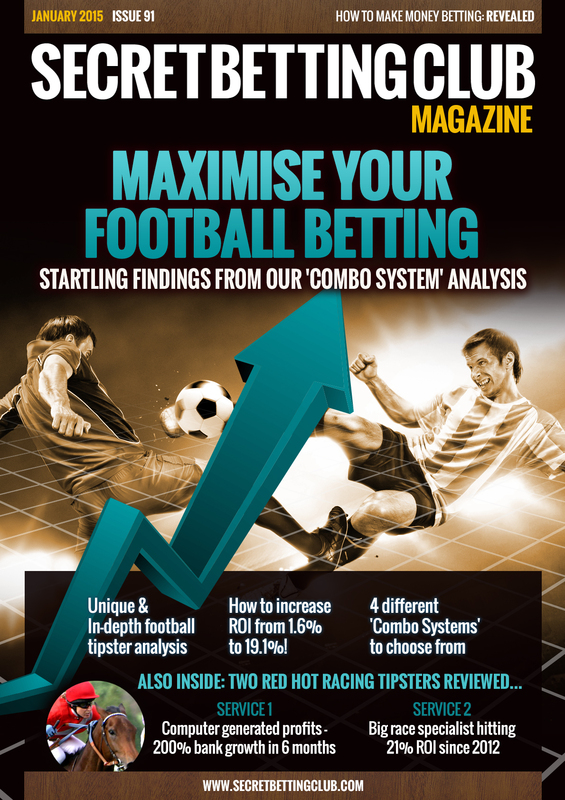 The very latest BUMPER Smart Betting Club Magazine has just been released and once again its jam-packed full of expertise, tipster reviews and analysis to help you make money betting..
FOOTBALL: Specific strategies for our ‘Combo Tipster’ method. Four strategies to make startling results with our football combo method. The computer genius who is making huge racing profits – even at Betfair SP! The top Irish tipster hitting big numbers for the big meetings. You can pick up your copy of this magazine, the instant you join our service at the Smart Betting Club with full access to our exclusive members-only area. In yesterday’s blog we detailed how our members are bucking the punting trend, with 83.61% making a profit in 2014. Missed it? Check out yesterday’s blog here. But just how are the Smart Betting Club membership so successful, when traditionally just 2% of the punting public supposedly making a profit? Information: Our members have the latest information on winning tipsters and profitable strategies. Education: We help our members learn to become a pro punter, as well as offering specific advice on issues such as getting your bets on as you become successful. Support: We’re on hand to help with your questions and guide you on your punting journey. What do you do if you’re following a racing tipster that provides each way selections? An each way bet, being two separate wagers, should hold value for both the win part of the bet and the place part. Trouble is, the odds offered by an Exchange for the place are often considerably shorter than those you would get if placing the bet through a bookmaker. Taking a long term view, I have to confess that the idea of not securing value on what essentially is a large proportion of my bets troubles me, and it should bother you too. As ever though, there is always more than one way of skinning a cat. Allow me to use my experience with [tipster revealed to SBC members] service to explain. After taking guidance from the tipster, I settled last season on a strategy that involved the placement of in-running lays on the bets I struck using Betfair. I would stick the lay in somewhere just above the 2.0 level, meaning that if the horse looked like it had a 50%+ chance of winning, my lay would be matched and an equalised profit returned, regardless of whether or not the horse went on to win (you’d be surprised how many horses go odds on in running but don’t cross the line first). Season 2012/13 was a quite spectacular one for the in-running lay strategy, running at an overall ROI of 63%, which I can’t imagine is anything other than a bit of an anomaly and certainly not to be treated as the norm. Not only do SBC members get access to the latest lists of profitable tipsters, we also show you how to use them and how to make even more profits! In the above article, the author shows you how to squeeze out some extra profits using Exchanges as an alternative to Best Odds Guaranteed promotions that bookmakers may remove as you become successful. All part of our quest to Inform, Educate & Support you on your way to profitable betting. The great news is that all of this is available for the equivalent of just £1.85 per week and if choosing either Gold or Platinum membership – comes with a full 30-day money back guarantee if not in any way satisfied once you have joined. These sort of once in a lifetime jackpots are actually great advertising for the bookies and are usually initiated by their well-oiled PR machines. It makes the everyday punter believe and keep lumping their beer money on their weekend accumulator. But the truth is that overall, just around 2% of all punters make money consistently. The bookies love weekend ‘acca’ man because they make up the majority of the punting public, but there is a small community of punters where this statistic is turned on its head. Instead of 2% of punters making a profit, here at the Smart Betting Club, 83.61% of our members responding to a recent survey told us that they made money betting in 2014! That’s nearly as many as 4 out of 5 voting members which compares very nicely to the 2% or 1 out of 50 in the non-SBC world! Not only did the majority of respondents state that they make money, the proportion of happy punters has also increased by more than 5% from when we asked the very same question last year. We’re not just talking a few pennies either. Not only did our survey respondents tell us they made a profit, they also revealed how much they made. The vast majority of those making a profit made more than £1,000, with more than 15% of respondents making more than £10,000! Not bad for the effective daily cost of just 26p to be a member of the Smart Betting Club. As much as we would love every single one of our members to make a profit, let’s be realistic. Not everyone is going to make it work. We give you all the tools you need to make a profit, but it still comes down to your discipline, perseverance and yes, a little bit of luck. All these results were based on a straight-forward poll where we asked SBC members to honestly answer just how their betting fared last year. Each member could only vote once and no incentives were offered for answers to ensure they were 100% fair and accurate. The full results of this poll have been published in our 2015 Betting & Tipsters Award Report, where as a service we took the pulse of just how last year fared for our members. If you are keen to follow in the footsteps of some of our members and join the majority who win, then it’s a great time to join us at the Smart Betting Club. This is because we are about to release the 91st edition of our magazine, featuring a highly profitable football ‘combo’ strategy, plus reviews of two highly promising tipsters that we have uncovered. All of which is covered by our 30 day 100% risk-free money back guarantee if not satisfied after you join – now you can’t say fairer than that. Why not try us today and chance your arm at making 2015 a successful year betting with our help. After yesterday’s bout of bookie bashing where we revealed who you voted for as the worst bookmaker from 2014 (Hello Stan James), today its time to uncover the bookmakers you actually rated as the best. These are the bookmakers that either offer a high quality of service, welcome winners or simply put forward the best value odds. 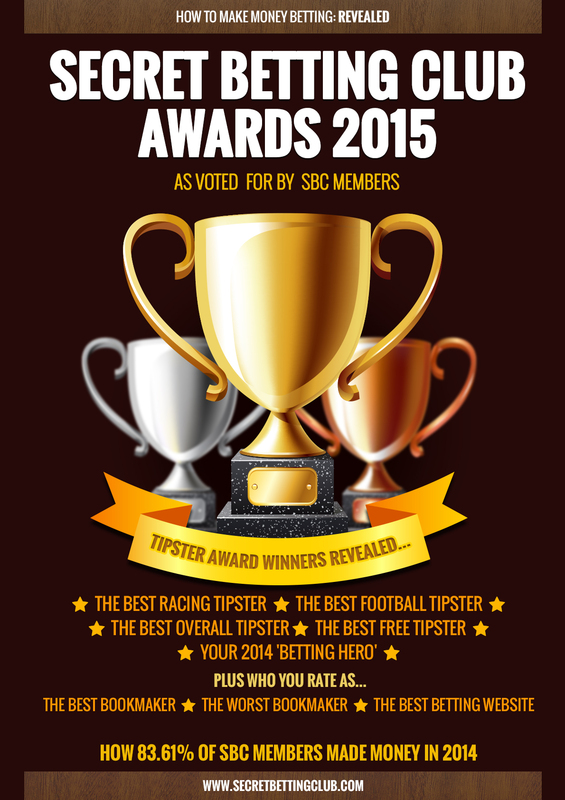 The results were compiled from both the public and SBC member votes received via our December 2014 survey – designed to build the ultimate list of the best bookmakers. So without further ado, here are the results for the best bookmaker category as voted for by YOU! Bet365 – Have A Bang On That! Clear top of the pile this year and taking the Gold award was Staffordshire-based bookies Bet365 who polled 36.5% of the popular vote. Next up was last year’s winner – Pinnacle Sports who took Silver with a commendable 23.0% whilst Betfair scooped 19.7% of the vote and the Bronze award. Interestingly – Pinnacle were last year’s winner with 42.7% of the vote, they lost a fair chunk of support in 2014, a decision no doubt influenced by their withdrawal from the UK market back in October this year. Further down the poll, both relative newcomer Matchbook and old-stager William Hill also polled a creditable share of votes with 7.6% and 7.0% respectively. Congrats must go to Bet365 though for scooping the top prize! Just as it is important to know who not to bet with – so it is even more vital to know exactly which bookmakers you SHOULD bet with and why. The best bookmakers and exchanges very often put forward the best value odds and ultimately better odds means better profits for you when your bets come in. Those such as Pinnacle Sports & Matchbook also actively welcome winners – so if you are fearful of not getting on or being limited for being profitable, they offer a genuine solution. Please note – those of you based in the UK who are no longer able to bet with Pinnacle, should certainly check out Matchbook. Read our exclusive interview here as to why. We also feel it is very important to highlight both the best and worst in the industry, given the lack of clarity suffered by punters when it comes to finding the right bookmakers. If interested in reading more on this topic, you can access our full 2015 Awards Report as a Smart Betting Club member. All available to you the instant you sign-up as a Smart Betting Club member. Your votes are in for the worst bookie award….here are the results! Wednesday saw the release of our 2015 Tipster & Betting Awards Report, which features the lowdown on the very best tipsters and betting experts across a variety of categories as voted for by Smart Betting Club members. However, this year for the very first time we also opened up a number of categories to the public vote, including that of the worst bookmaker, which proved to be an extremely competitive category indeed! Not all bookmakers are created equally and these awards provide us with the opportunity to shame those rated the worst. Whether it is offering poor value odds, shoddy customer service or simply not letting you get your full stakes on – you voted in your droves. So without further ado, here are the results for the worst bookmaker category as voted for by YOU! Stan James Take A Bow! This was a hugely competitive award with votes spread very evenly across a wide cross-section of bookmakers, helping to neatly showcase the general disregard felt for many nominees. Top of the spot this time out, just as they were last year was Stan James with 17.3% of the popular vote, which suggests this under pressure company has a lot to do to win back favour with many punters. After all – it takes a certain type of bookmaker to claim the wooden spoon prize two years on the bounce! Not far behind was the often woeful Boylesports with 14.9% whilst Coral climbed from 6th spot last year to win the Bronze award with 13.6% of all votes. Creditable mentions must also go to Bet Victor and Betfred who each notched over 10% of all votes. The trio of Skybet, Betway & SportingBet also attracted the ire of several punters with a further 22.5% between them to round things off. So there we have it – Stan James is this year’s recipient of our Worst Bookmaker Award. We somehow doubt they will be using our magnificent Wooden Spoon Gold banner on their homepage anytime soon though! As well as allowing us to poke fun at some of the worst culprits, this award does have a serious side to it. First of all – the simple knowledge of which bookmakers are rated the worst can help you work out just who to avoid betting with. Secondly there are also very few (if any) resources or websites you can visit these days where you can find an independent take on the best and worst bookmakers. Our report aims to help fill that gap. This honesty void when it comes to bookies is often because many in the betting media rely upon bookmaker advertising to keep them going – and let’s face it – they are not going to bite the hand that feeds them. Thankfully, due to our unique model of being funded by our members (and not bookmakers), this does allow us at the Smart Betting Club to speak openly and honestly about what’s really going on. Plus the full stats on the fact that 83.61% of SBC members made a profit last year from their betting. To kick-start 2015 with a bang, today sees the release of our 3rd Annual Betting & Tipsters Award Report, which reveals everything from the best football & racing tipsters (both free and paid) to the best bookmakers & websites. Voted for by both SBC members and the general betting public, these awards really do highlight the most deserving winners – and just who you should be following or betting with in 2015. 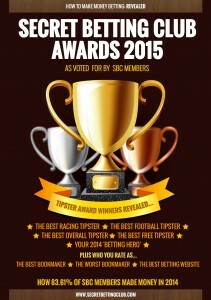 The Best Racing, Sports & Overall Tipster awards (Gold, Silver & Bronze for each category). The best (and worst) bookmakers as voted for by both SBC members and the general public. You can pick up your copy of this fascinating Awards Report, the instant you join the Smart Betting Club. That’s not all though because as an SBC member you will also gain access to our huge back catalogue full of tipster reviews, expert interviews and guides, betting systems and profitable betting advice.